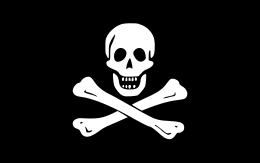 The tradeetional "Jolly Roger" o piracy. Piracy is an act o robbery or creeminal violence bi ship- or boat-borne attackers upon anither ship or a coastal aurie, teepically wi the goal o stealin cargae an ither vailuable eetems or properties. Thae wha tak pairt in acts o piracy are cried pirates. This page wis last eeditit on 2 Mey 2017, at 00:16.